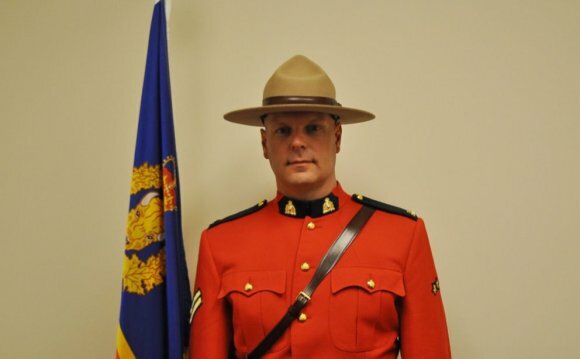 The RCMP is recognizable throughout the world due to its unique uniforms. This page describes the original uniforms of the North-West Mounted Police and some of the arms and accoutrements that were used throughout the history of the RCMP. In the 1800s the uniform of the North West Mounted Police (NWMP) was similar to the one worn by the British Army. In fact, the very first uniform used by the NWMP was issued from militia stores in Ottawa. The scarlet Norfolk jacket, simple and practical, without trimmings, was chosen so that the North West Mounted Police would be readily identifiable with the reputation of their British predecessors (rather than the Americans in blue uniform) thereby gaining the confidence and respect of the First Nations. The breeches or trousers were steel gray or flesh coloured, not blue like today. Black Wellington boots with spurs were worn on parade and long brown boots on duty. The original uniform also included a pill box cap, which was worn tilted to the right side of the head and held on by a thin strap under the chin. These caps were made of blue cloth and were decorated with a ribbon of yellow or gold on the side and thin cord of the same colour on the top. The design, like the design of the jacket, was copied from British military uniforms of the time. A dull white helmet was also used. It eventually had a brass spike added with a plume varying in colour according to rank. Sundries included a white haversack, white gauntlets and a brown leather belt. The belt buckle and buttons eventually bore the NWMP badge. A holster, worn on the left side, carried a Deane and Adams revolver. A short Snider-Enfield carbine was carried and when mounted a saddle bucket was used on the rear right side of the horse. When the Force marched westward in 1874 lances were carried part of the way. A universal saddle, British Army pattern, was used until 1883 when it was replaced by the California Stock saddle. Robert Gordon Teather (1947–2004) was a 28-year veteran of the Royal Canadian Mounted Police (R.C.M.P.) who was awarded the Cross of Valour, Canada's highest award for bravery, for a rescue he performed in 1981. CANADIAN ROYAL MOUNTED POLICE ALLOWED TO SMOKE POT!